The Trunchbull let out a yell. . . The Trunchbull lifted the water-jug and poured some water into her glass. And suddenly, with the water, out came the long slimy newt straight into the glass, plop! The Trunchbull let out a yell and leapt off her chair as though a firecracker had gone off underneath her. She stared at the creature twisting and wriggling in the glass. The fires of fury and hatred were smouldering in the Trunchbull’s small black eyes. The Trunchbull was in such a rage that her face had taken on a boiled colour and little flecks of froth were gathering at the corners of her mouth. But Matilda was also beginning to see red. She had had absolutely nothing to do with the beastly creature in the glass. By golly, she thought, that rotten Trunchbull isn’t going to pin this one on me! I might even delve deeper into natural history and say, “The periodical cicada spends six years as a grub underground, and no more than six days as a free creature of sunlight and air. Your son Wilfred has spent six years as a grub in this school and we are still waiting for him to emerge from the chrysalis.” A particularly poisonous little girl might sting me into saying, “Fiona has the same glacial beauty as an iceberg, but unlike the iceberg she has absolutely nothing below the surface.” I think I might enjoy writing end-of-term reports for the stinkers in my class. But enough of that. We have to get on. Occasionally one comes across parents who take the opposite line, who show no interest at all in their children, and these of course are far worse than the doting ones. Mr and Mrs Wormwood were two such parents. They had a son called Michael and a daughter called Matilda, and the parents looked upon Matilda in particular as nothing more than a scab. A scab is something you have to put up with until the time comes when you can pick it off and flick it away. Mr and Mrs Wormwood looked forward enormously to the time when they could pick their little daughter off and flick her away, preferably into the next county or even further than that. It is bad enough when parents treat ordinary children as though they were scabs and bunions, but it becomes somehow a lot worse when the child in question is extraordinary, and by that I mean sensitive and brilliant. Matilda was both of these things, but above all she was brilliant. Her mind was so nimble and she was so quick to learn that her ability should have been obvious even to the most half-witted of parents. But Mr and Mrs Wormwood were both so gormless and so wrapped up in their own silly little lives that they failed to notice anything unusual about their daughter. To tell the truth, I doubt they would have noticed had she crawled into the house with a broken leg. Matilda’s brother Michael was a perfectly normal boy, but the sister, as I said, was something to make your eyes pop. By the age of one and a half her speech was perfect and she knew as many words as most grown-ups. The parents, instead of applauding her, called her a noisy chatterbox and told her sharply that small girls should be seen and not heard. By the time she was three, Matilda had taught herself to read by studying newspapers and magazines that lay around the house. At the age of four, she could read fast and well and she naturally began hankering after books. The only book in the whole of this enlightened household was something called Easy Cooking belonging to her mother, and when she had read this from cover to cover and had learnt all the recipes by heart, she decided she wanted something more interesting. Nearly every weekday afternoon Matilda was left alone in the house. Her brother (five years older than her) went to school. Her father went to work and her mother went out playing bingo in a town eight miles away. Mrs Wormwood was hooked on bingo and played it five afternoons a week. On the afternoon of the day when her father had refused to buy her a book, Matilda set out all by herself to walk to the public library in the village. When she arrived, she introduced herself to the librarian, Mrs Phelps. She asked if she might sit awhile and read a book. Mrs Phelps, slightly taken aback at the arrival of such a tiny girl unaccompanied by a parent, nevertheless told her she was very welcome. “Where are the children’s books please?” Matilda asked. From then on, every afternoon, as soon as her mother had left for bingo, Matilda would toddle down to the library. The walk took only ten minutes and this allowed her two glorious hours sitting quietly by herself in a cosy corner devouring one book after another. When she had read every single children’s book in the place, she started wandering round in search of something else. Mrs Phelps, who had been watching her with fascination for the past few weeks, now got up from her desk and went over to her. “Can I help you, Matilda?” she asked. Mrs Phelps looked down at Matilda from her great height and Matilda looked right back up at her. Mrs Phelps was stunned. “Exactly how old are you, Matilda?” she asked. “Four years and three months,” Matilda said. Mrs Phelps was more stunned than ever, but she had the sense not to show it. “What sort of a book would you like to read next?” she asked. Mrs Phelps looked along the shelves, taking her time. She didn’t quite know what to bring out. How, she asked herself, does one choose a famous grown-up book for a four-year-old girl? Her first thought was to pick a young teenager’s romance of the kind that is written for fifteen-year-old schoolgirls, but for some reason she found herself instinctively walking past that particular shelf. “She doesn’t really care what I do,” Matilda said a little sadly. Mrs Phelps was concerned about the child’s safety on the walk through the fairly busy village High Street and the crossing of the road, but she decided not to interfere. It was a formidable list and by now Mrs Phelps was filled with wonder and excitement, but it was probably a good thing that she did not allow herself to be completely carried away by it all. Almost anyone else witnessing the achievements of this small child would have been tempted to make a great fuss and shout the news all over the village and beyond, but not so Mrs Phelps. She was someone who minded her own business and had long since discovered it was seldom worth while to interfere with other people’s children. "A true genius . 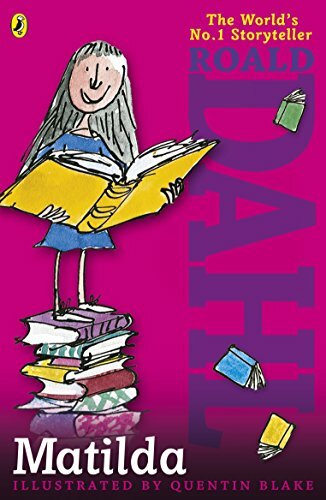 . . Roald Dahl is my hero" David Walliams Matilda's parents have called her some terrible things, but the truth is she's a genius and they're the stupid ones. Underestimating Matilda proves to be a big mistake as they, along with her spiteful headmistress, Miss Trunchbull, soon find out when Matilda discovers she has a very special power.